It’s time to celebrate because it’s birthday theme time! Kids LOVE birthdays so it’s a perfect theme to do in September when students are getting to know each other. But it’s not a seasonal theme so you can do a birthday theme anytime during the year. Some teachers do a birthday theme in December to celebrate Jesus’s birthday. Grab your lesson plan binder, and let me help you fill it tons of fun activities your preschool, pre-k, or kindergarten kiddos. You can grab all of the Birthday Themed Math & Literacy Centers HERE and make sure grab the Cupcake Play Dough Mats FREEBIE later in this post. Spatula Painting! Every birthday needs cake and icing so why not paint with “icing” using spatulas! Put those paint brushes away and grab some mini spatulas from Dollar Tree. For “icing,” I added white glue to the paint to make it super shiny and to give a sticky texture. It’s equal parts glue and paint. It’s great fine motor work too because to spread the icing (aka paint) students have to move their wrists back and forth to spread the paint on the paper. Streamer Art! We do so many different types of collages the first part of the year to help with scissor skills and tearing skills. Streamers are perfect to tear or cut for little learners. If kiddos are struggling using scissors, try using loop scissors that bounce back open as they cut. If they love cutting like my students do, try a wrapping paper collage, which is perfect for a birthday theme. Birthday Handwriting (the FUN way)! Handwriting doesn’t have to be worksheets. Let’s make it fun with birthday themed tracing mats! Laminate the tracing mats so students can trace the letters with dry erase markers over and over. Put out mini erasers or glass gems so students can build the letters too! Sprinkles Birthday Writing Tray! If you are daring, make a writing tray with birthday sprinkles! I put a tray under it to catch all the extra sprinkles that “hop” out. Write letters, numbers, shapes, different types of lines or sight words in the writing tray. This tray is from this lacing set. You can also use one of those kid divided plates or any small tray. Birthday Letter Dot It! Learning letter names can be HARD so make it FUN with a birthday letter dot it. Pick a letter, identify it, find it on the game board and dot it with a cupcake counter or mini eraser. We played this game for small group then I put it in the library center for students to play independently. Cupcake Letter Match! Students can match uppercase and lowercase letters. For the littlest of learners, match uppercase and uppercase letters. I’m sure you’ve noticed that I’ve used the cupcake letter tops for some of the literacy activities above! These cupcake letter puzzle pieces can be used so many ways. Birthday Themed Writing Table! It’s packed with things to make birthday cards, envelopes, birthday vocabulary words and phrases, blank cards (aka folded paper), Happy Birthday word strips, and How to Make a Card poster. Make sure you put student name cards and family word cards in the center so they can write who their cards are for. Students will LOVE writing and drawings cards for their families and friends. Birthday Books! Our bookshelf was packed with my favorite birthday themed books. Check out my (and my students) top 16 birthday books HERE. Birthday Candle Count Class Book! Make a class counting book for the classroom library that students can read over and over. You can see our book at the bottom of the bookshelf in the photo above. Birthday Candle Patterns! When celebrating a birthday, everyone sings and then the birthday person blows out the candles. So I thought why not use candles as a math manipulative and make color patterns. My kiddos went CRAZY for this activity! They would make a pattern then pretend to blow out the candles. To make it even more engaging, give each child a ball of play dough and they can make the pattern in their play dough cake. I found these candles at Walmart. FREE Cupcake Counting Mats! Students count out the corresponding number”sprinkles” for the cupcake using tweezers. Students can also make “sprinkles” with play dough by rolling small pieces of the play dough and “sprinkling” them on the cupcakes. Birthday Cake Shapes! Students match the shape candles to corresponding shape birthday cake. I am going to warn you, after playing all these yummy cake and cupcake games with your kiddos you may crave something sweet and have to stop by a bakery on the way home (I did). Birthday Themed Blocks Play, STEM & Science! Birthday Blocks & STEM! Check out these colorful cups and shot glasses I found for students to build with in the blocks center! Students will have a blast engineering and building with cups. It can be tricky to build with cups so students will also be doing tons of problem solving too. Five Senses! A child’s birthday is filled with sounds, smells, tastes, and smells so it’s the perfect theme to do a 5 senses science unit! At the science table, I have set up sound jars and smelly jars for students to explore. You can grab my 5 Senses unit HERE. Birthday Play Dough Tray! Grab some number candles, regular candles, silicone cupcake liners and some small pans to make an easy (and math packed) play dough tray. If you want a funfetti type play dough just make a batch of play dough, and once it cools let students sprinkle in real sprinkles! Add a few drops of vanilla extract and it will make it smell like real birthday cake too. Birthday Sensory Table! It’s colored rice with number candles, regular candles and either plastic or silicone cupcake cups. I found the number candles at Walmart a few years ago. You can also add pom poms for “sprinkles”. There are so many things to see, hear, smell, touch, and taste for a birthday so investigate the 5 senses at the science table! You can set up a table with one sense at a time or make a tub for each sense. Just a note, I do not set up a sense of taste table for students to explore just to be safe. I do the sense of taste during whole or small group time. 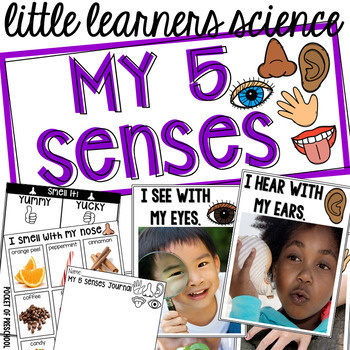 You can grab all the printables and visuals in my 5 Senses Science Unit on TPT HERE. For sense of smell, create smell jars using plastic salt shakers from the Dollar Tree. For the sense of hearing, create listening containers again using small snack containers from the Dollar Tree. I covered the sides with yellow duck tape so they can’t peek at what’s inside. Create I Spy bottles for the sense of sight and put items inside socks for students to feel for the sense of touch. 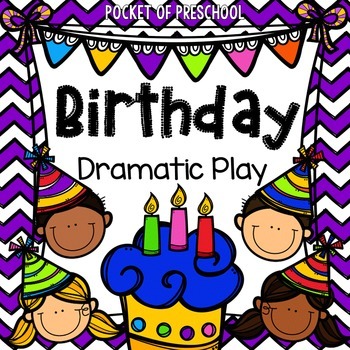 Add birthday themed props and students can pretend to have birthday parties in the dramatic play center! Click HERE to see my birthday party up close in my classroom! Can you tell I really LOVE doing a birthday theme in my classroom with my students? If you haven’t tried a birthday theme yet, try it. I promise it will be a ton of fun and tons of learning will occur through play! If you want the printables…. 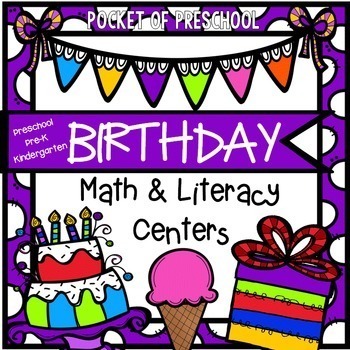 grab the Birthday Math & Literacy Centers HERE, Birthday Dramatic Play HERE, or the5 Sciences Little Learners Science Unit HERE. If you need to find a few fabulous picture books for a birthday theme check out my top 16 Birthday Books!